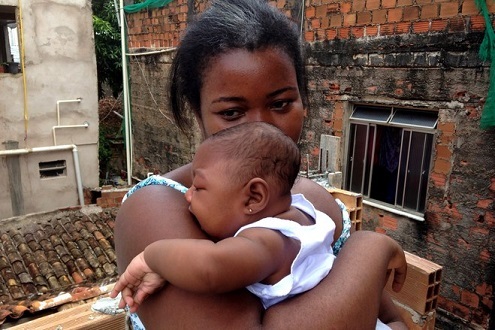 A report from the Argentine doctors’ organisation, Physicians in the Crop-Sprayed Villages regarding Dengue-Zika, challenges the theory that the Zika virus epidemic in Brazil is the cause of the increase in the birth defect microcephaly among newborns.The increase in this birth defect, in which the baby is born with an abnormally small head and often has brain damage, was quickly linked to the Zika virus by the Brazilian Ministry of Health. However, according to the Physicians report, the Ministry failed to recognize that in the area where most sick people live, a chemical larvicide that produces malformations in mosquitoes was introduced into the drinking water supply in 2014. This poison, Pyriproxyfen, is used in a State-controlled programme aimed at eradicating disease-carrying mosquitoes. The Physicians added that Pyriproxyfen is manufactured by Sumitomo Chemical, a Japanese “strategic partner” of Monsanto. Pyriproxyfen is a growth inhibitor of mosquito larvae, which alters the development process from larva to pupa to adult, thus generating malformations in developing mosquitoes and killing or disabling them. It acts as an insect juvenile hormone or juvenoid, and has the effect of inhibiting the development of adult insect characteristics (for example, wings and mature external genitalia) and reproductive development. It is an endocrine disruptor and is teratogenic (causes birth defects), according to the Physicians. Pyriproxyfen is a relatively new introduction to the Brazilian environment; the microcephaly increase is a relatively new phenomenon. So the larvicide seems a plausible causative factor in microcephaly – far more so than GM mosquitoes, which some have blamed for the Zika epidemic and thus for the birth defects. There is no sound evidence to support the notion promoted by some sources that GM mosquitoes can cause Zika, which in turn can cause microcephaly. Incredibly, out of 404 confirmed microcephaly cases in Brazil, only 17 (4.2%) tested positive for the Zika virus. The Argentine Physicians’ report, which also addresses the Dengue fever epidemic in Brazil, concurs with the findings of a separate report on the Zika outbreak by the Brazilian Association for Collective Health (Portuguese: Associação Brasileira de Saúde Coletiva, Abrasco). Abrasco, whilst urging caution in assuming a direct cause and effect, demanded the “immediate suspension of [use of] Pyriproxyfen and all growth inhibitors … in drinking water.” The organization is opposed to the use of growth inhibitors in the context of an ongoing outbreak of fetal malformation. Abrasco condemns the strategy of chemical control of Zika-carrying mosquitoes, which it says is contaminating the environment as well as people and is not decreasing the numbers of mosquitoes. Abrasco suggests that this strategy is in fact driven by the commercial interests of the chemical industry, which it says is deeply integrated into the Latin American ministries of health, as well as the World Health Organization and the Pan American Health Organisation. Abrasco names the British GM insect company Oxitec as part of the corporate lobby that is distorting the facts about Zika to suit its own profit-making agenda. Oxitec sells GM mosquitoes engineered for sterility and markets them as a disease-combating product – a strategy condemned by the Argentine Physicians as “a total failure, except for the company supplying mosquitoes”.